In 2010, I told God it’s all or nothing and I was ready to do a complete 360 and live strictly for him. No matter the trials and tribulations I’d run into, I wasn’t going to give up, but continue to pray and let him use me to glorify him. I knew his calling for me wasn’t to be a pulpit preacher; he wanted me to travel the world and tell people about him while at the same time, feeding and clothing people less fortunate than myself. After days of praying and fasting God gave me the vision and a name. He told me everywhere you go people will come to you searching for hope. A hope that’s visible, and that they can see life-changing moments just like they did during his time. People would endure so much from illnesses doctors couldn’t heal, and problems that were truly unheard of during this time. But when people heard Jesus was in the city, that brought joy and hope to those that were suffering. 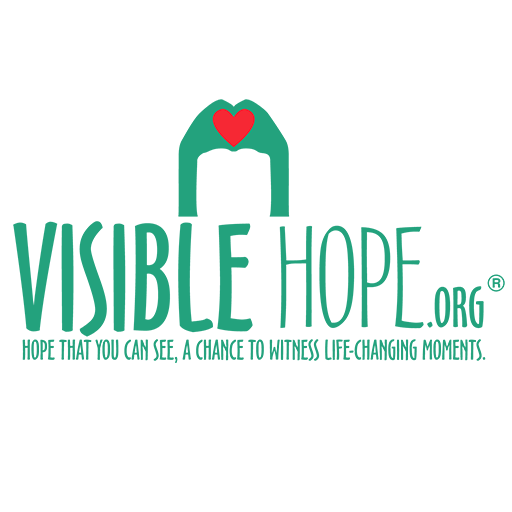 So with that, I came up with the name, Visible Hope: Hope that you can see; a chance to witness life-changing moments. I was then able to envision a program that would give people hope and help with food, clothing and other life-saving resources that would in turn give them support, encouragement, and empowerment. I remember asking God, “what’s next?” I wanted desperately to know, where are the funds going to come from to get this started? A voice spoke to me and said, “you have a savings account.” I thought, “but how am I supposed to live if I give it all away for this program?” He answered, “You’re worried about the wrong thing. If I lead you to it, I’ll see you through it.” I didn’t see the entire vision then but I saw it throughout the years right up until now. Every time we’ve ever hosted an event we’ve always had more than enough to feed his people. Even during times when I knew we didn’t have enough, he’d always do something amazing during our feeding events to let me know he had us covered. When I first started the Meals 4 Hope feeding program, I was only able to feed 20 people once a month. The numbers have since grown over the years to where we are now serving more than 500+ home-cooked, hot, and nutritious meals a month in 2018. We’ve also been able to add more programs to cater to those that are without. Some of our programs include our Closet of Hope Program that provides clothes to children and adults free of charge, and our utility bill assistance program for when you’re going through rough times. We also offer employment resources that may help you land a new job to help improve your family’s financial stability. We also assist with the USDA Food Box Program for individuals and families who are in need of food in the home, but simply can’t afford to purchase it. Our funeral assistance program is for families that don’t have anywhere else to turn, but desperately need financial assistance to put their love one to rest. Temporary housing assistance is also available, depending on the circumstances. Love: We must love God wholeheartedly. Grow: We must strive to continually grow in faith. Serve: We must commit to display God’s love through serving others. Go: Standing still is not an option; we must go and make a difference.